In 2001, after more than 25 years in Toshiba’s nuclear energy systems business, first as a researcher in the R&D labs, and later as a manager responsible for business development, I was transferred to the corporate head office. I was appointed as general manager of the External Relations Division, which covers the company’s relations with governments, industry and business, as well as carrying out policy planning activities. As the division’s portfolio included running our Social Contributions Office, I also became responsible for oversight of the Toshiba International Foundation, or TIFO, as we are known within and outside Japan. TIFO is a non-profit and independent grant making organization dedicated to promoting activities and international exchanges that lead to a deeper understanding of Japan and contribute to local and global community development. I must confess that when the President of TIFO suddenly stepped down in 2006 and I replaced him, I had little enthusiasm for its work. My initial assumption was that a new, permanent president would be nominated within six months, but time proved me wrong and I ended up serving almost seven years in the role, until the end of 2012. Once I started to work as the executive head of TIFO, I had to meet many people seeking funding. My conversations with these movers and shakers in art, culture and education were interesting and taught me a lot but they also left me perplexed; it seemed that we moved in utterly different spheres. Looking back, I realize that the confusion I felt marked a turning point in my life; what I now affectionately call “close encounters of the third kind” were in fact among my most valuable learning experiences as President of the organisation. The truth was that although I was comfortable and well versed in the world of business, I was an alien creature when it came to the world of arts and cultures. My first rather simple doubt was whether or not non-Japanese people could truly understand our culture. Secondly, I honestly could not grasp why foreigners would want to study Japanese art and culture. Reflecting on those days, I realise that at the time I really was not the right person to take on the presidency. Things changed thanks to my encounter with the Sainsbury Institute for the Study of Japanese Arts and Cultures (SISJAC), which rescued me from my awkward situation. The people there became my first teachers in the world of Japanese arts and culture, answering my questions and overcoming my perplexity. I cannot remember exactly when I first met Dr Nicole Rousmaniere, the Founding Director of SISJAC. I recall that it was in Tokyo, perhaps in the late autumn or early winter of the year I became TIFO’s President. I was overwhelmed by her passion and energy for Japanese art and culture, which seemed to burn with the intensity of the sun. Her passion was rooted in a vast knowledge of Japanese art, from porcelain and contemporary craft to Japanese painters such as Ito Jakuchu, who was just becoming popular in Japan at that time. After this meeting I had an opportunity to visit the Institute in Norwich and to meet Dr Simon Kaner, then Deputy Director of SISJAC, when I participated in the British Association for Japanese Studies conference hosted at the University of East Anglia. Dr Kaner warmly welcomed me to the Institute in spite of my visit falling on a Saturday, when the Institute was normally closed. He told me that his field of expertise was Japanese archaeology, in particular Jomon dogu, and I learned from him that the Sainsbury Institute had been founded to promote knowledge and understanding of Japanese arts and cultures, through the generosity of Sir Robert and Lady Sainsbury and with the devoted academic support of Dame Elizabeth Esteve-Coll, a founding trustee. From being like a shell-fish, lost in the ocean and shut off from a wider understanding of the world of Japanese arts and cultures, my conversations with Dr Rousmaniere and Dr Kaner, with their rich resources of knowledge, ideas and inspiration, relieved my confusion about the world I was now encountering at TIFO. I was wrong to think that it would be very difficult for a foreigner to understand Japanese culture and art. I stubbornly believed that, nourished by its climate and created by its people, our unique culture must have a certain core element that could only be understood by the Japanese themselves, despite there being certain universal similarities. Indeed, differences in civilization and culture may well originate from differences in time and space – time being history and space the climate. But the big discovery in my conversations with Dr Rousmaniere and Dr Kaner was that precisely because they were not Japanese, non-Japanese researchers and experts could perceive angles that might have been ignored or not even noticed by their Japanese colleagues. I gradually came to realise that if there were aspects of Japanese art and culture that might not be easily understood by non-Japanese experts, there must be other aspects that might be missed by Japanese experts. While Japanese might see their culture subjectively, foreign experts might observe phenomena with a more objective eye. In addition, given their own cultural background and exposure, foreigners might examine and analyze Japanese cultures from their own unique perspectives. Ultimately, where there is close collaboration between Japanese and foreign experts, deeper and cutting-edge research may often be the result. 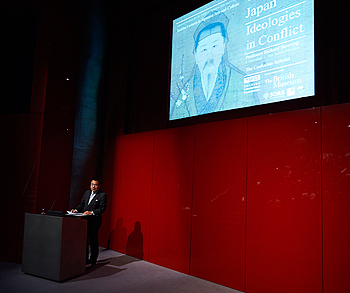 During my seven years of working with the Sainsbury Institute for the Study of Japanese Arts and Cultures I have come to highly value their role in the promotion of Japanese arts and cultures abroad. Being a rather small institution, SISJAC always endeavours to work closely with other organizations in the UK, Europe and Japan. The worldwide research networks that they have established with other institutes, universities and museums, support the Institute in conducting projects and in educating and mentoring young experts. Furthermore, the Institute keenly promotes Japanese arts and cultures to the wider public by means of its outreach activities. 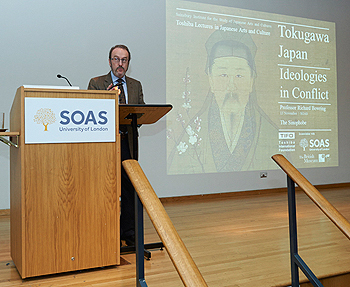 In the annual Toshiba Lecture Series, supervised by Dr Rousmaniere and Dr Kaner since 2003, distinguished scholars reveal hidden treasures of different aspects of Japanese arts and cultures to the public in London and Norwich. TIFO is proud to have partnered the Sainsbury Institute for the decade of the series to date, together opening windows into other worlds. 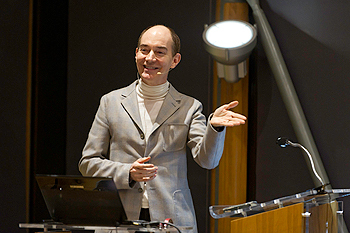 The Sainsbury Institute for the Study of Japanese Arts and Cultures was established in 1999 and will celebrate its 15th anniversary in 2014, when the Toshiba international Foundation will celebrate its 25th anniversary. Both institutions may be infants in the long history of promoting Japanese studies abroad, but we are determined to continue our efforts to promote our cultural heritage, not only for the benefit of Japan but for the global community. Ms Mizutori Mami joined the Sainsbury Institute as Executive Director in 2011 and she has strengthened its structure and organizational aspects. However, even with all the hard work that the Institute carries out, it is impossible for them to continue to run their ambitious programs without external support. It would be a pleasure and an honor for TIFO to continue to work with SISJAC and I wish the Institute well in the future.